What are regular heat only boilers? Regular heat only boilers are the simplest types of boiler and in the past have been installed in the majority of homes in the UK. They create the hot water required for both your central heating system and the hot water that comes from your taps. Replacing your existing regular boiler with a new equivalent system should result in large savings in your energy bills. This is dependant on the age of the model you are replacing. 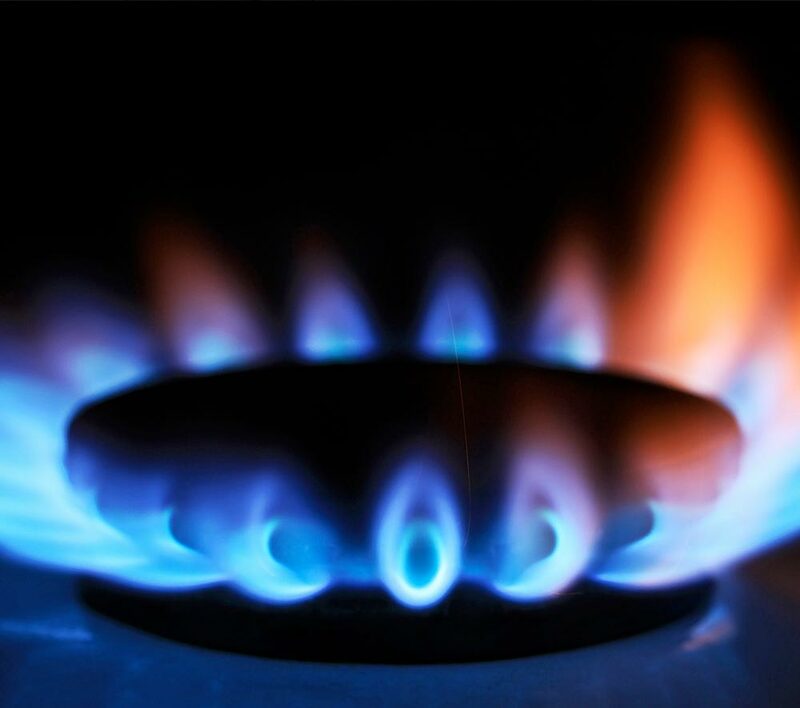 The savings are the result of the condensing element and technical advances which increase fuel efficiency, as more of the fuel is converted to useful heat in the boiler. A regular heat only boiler always requires a hot water tank and may also require a cold-water header tank in the loft. This is dependant on whether you are operating a vented or unvented hot water cylinder system. Unvented hot water systems (also known as a sealed system) operate under mains pressure, and take advantage of a bubble of air in the cylinder or a separate expansion vessel to allow expansion of the hot water. For this reason no cold water header tank is necessary. Vented hot water systems also require a cold water tank. 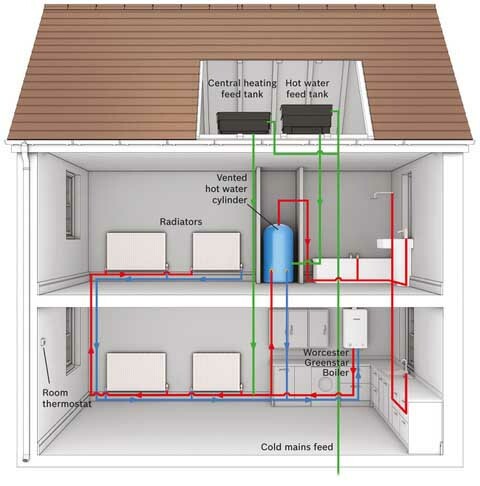 Conversely in a vented hot water system the hot water uses the vent pipe for expansion (which connects the hot water tank and the cold water header tank), therefore it requires a cold water tank in the roof. Like system boilers, regular heat only boilers are also compatible with solar thermal solutions. Therefore if you have this type of boiler and want to reduce your heating bills, installing a solar thermal solution will do this. By creating hot water using the sun, you can also take advantage of the RHI scheme that launched in Spring 2015, which pays you for the hot water you create. Please refer to the hot water tank section for more information on the two types of hot water cylinder systems available. As with the other types of boiler, any open vent boiler bought today will be a condensing open vent boiler, and will capture the latent heat in the exhaust fumes of the boiler with a heat exchanger, so less fuel is used to produce the same amount of heat. Heat only oil boilers are floor mounted due to weight. Gas heat only boilers can be wall mounted. 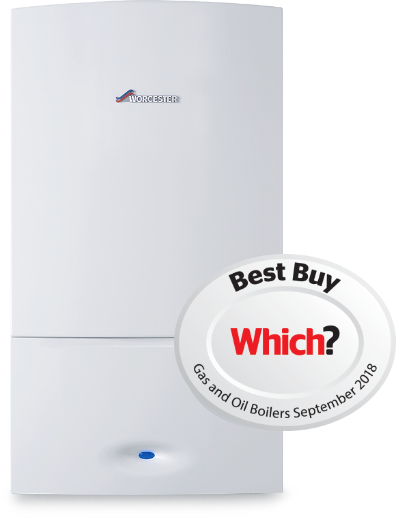 As regular heat only boilers are the most basic type of boiler, they are more reliable and are much cheaper to install. A major advantage of having a hot water tank in your heating system, is that you can pull hot water from multiple sources at the same time without any loss of pressure, as there is a large store of readily created hot water. In addition most hot water tanks have electric immersion heaters associated with them so you can still get hot water even if your indirect hot water source (i.e. the hot water from the regular boiler) stops entering the hot water tank. This is an obvious a benefit over combi boilers, as when broken, combi boilers will not be able to create any hot water at all. On the flip-side, as you are always required to install a hot water tank, and may also need to install a cold water tank (depending on the hot water cylinder type), regular heat boilers take up more space than a combi boiler. This needs to be considered from both a space and cost perspective. Another point to consider with hot water tank cylinders is that as soon as all the hot water is used, the boiler (indirect heating system) or immersion heater (direct heating system) will need to be switched on to replenish the water. The final point to note is that as hot water is being stored, there will be heat loss from the hot water cylinder. Conversely combi boilers create hot water on demand so there are no heat loss. Read about other boiler solutions available to heat your home; system boilers and combination boilers. If you would like to discuss whether a heat only boiler is the right solution for your home please get in touch.